Here’s what some of our customers say. Welcome to LCI Concrete LLC serving the Tulsa Metro area. We specialize in DRIVEWAYS. If your driveway is in need of replacement or you would like some decorative scoring on your driveway give us a call. We have been in business since 2005. Our team has over 70 years of combined experience. 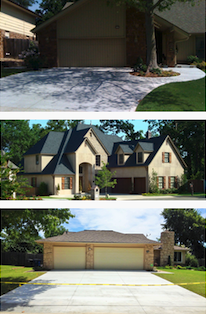 We’ve done over $1,000,000 of driveway replacements in the last two years. We have over 100 driveways you can look view. Our goal is to make you happy and make your new product look as though we’ve never been there. 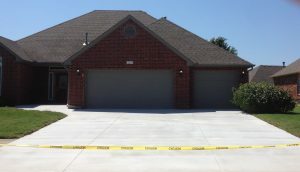 A concrete driveway gives your house’s first impression. An old cracked driveway can not only be unsightly but also dangerous. We use rebar in all of our concrete driveways, porches, and sidewalks. Thank you for giving us an opportunity. We serve the residential market. I’ve been a resident of the Tulsa Metro area for over 20 years. My wife and I have been married for over 16 years. I attended NSU and she’s an ORU alumni. We have 4 beautiful children. I’ve been self-employed for over 14 years and my prior Corporate America background was with HP and MCIWorldcom.